All employees deserve to have a comfortable and practical space to complete their work. At Adco Office Furniture, we’re proud to offer a streamlined 90 degree Aero workstation that’s built for demanding work environments. Depending on the logistical constraints and space limitations of your particular workplace, our Aero workstation is available in multiple sizes for you to choose from. Our goal is to deliver quality workstations that help your employees reach their full potential. The Aero workstation boasts a 25mm white melamine top and white powder coat frame for extra durability. In conjunction with traditional cantilever style legs and integrated cable management features, this creates a strong and sophisticated aesthetic for your office. 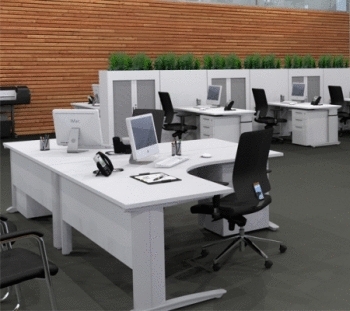 Employees and visitors alike will be impressed by the sense of professionalism these workstations exude. The Aero workstation can additionally be complemented with cabinet modules for storage and filing. This means loose documents and folders can be carefully stored away rather than carelessly strewn across the surface of the desk. Your employees will feel much more organised and well-prepared to handle the tasks they’re assigned. Adco Office Furniture is the number one choice for a 90 degree Aero workstation. Get in touch with our friendly team today for more information and further assistance.